This was my first project on double pointed needles. I got the basic pattern idea on the net (Can’t find the site now). It was a simple rectangle in a single color. I learnt knitting on dpns from Knitting Help. Amy’s video on dpns is very very helpful. It’s clear and easy enough to understand for a newbie like me. After knitting a few rows, I got a hang of it. I thought a rectangle in the same color would be boring, so added two rows of a contrast color to spice it up a bit. 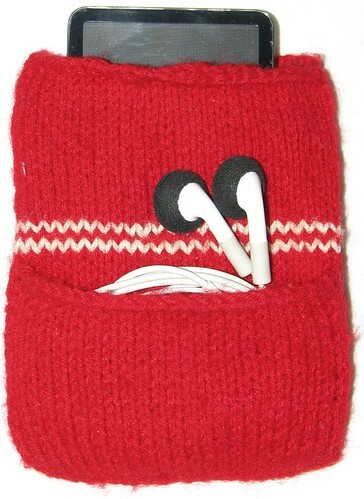 Result: a warm, cosy cover for my shining iPod. I used this for a few days. I used to keep the iPod and the earphones together and my iPod was getting scratches because of this. So, I added a pouch to the rectangle. What you see is this version. I want to add a flap with a button or Velcro. This will make the cover complete.